Me, my wife and three daughters were driving down a dark road in Littlestown, PA about 10 o'clock at night. My wife was driving - I was in the passenger front and my three daughters were in the back of the minivan. We were coming around the turn and my wife and two of my daughters screamed out and said they saw a human size butterfly passed in front of the minivan. It flew about 20 feet in front of the minivan and straight across the road and then disappeared. They said it looked like a giant butterfly wings with no head and it was moving very very fast. I didn't see it because I was looking out the side window. This just happened a few days ago. I immediately contacted the witnesses by telephone. 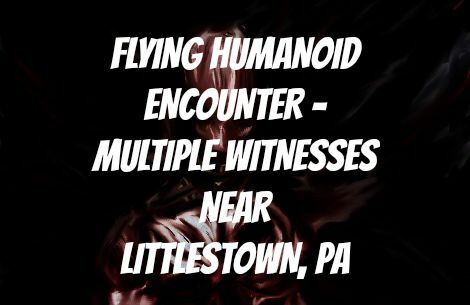 This encounter occurred on Sept. 23rd at around 10PM on Teeter Rd., southwest of Littlestown, PA. near the Quail Valley Golf Course (approx. 1.3 miles north of the Mason-Dixon Line). The driver (wife) and the two oldest daughters (18 & 13 yo) witnessed the being. It was described as a six-foot human form (no visible head...similar to some 'Mothman' descriptions) with huge butterfly-like wings (one of the daughters said the wings look like large angel wings). The wings had no feathers...covered in skin or other membrane. The color of the body and wings was light in color...whitish-pink hue. The being quickly flew directly across the road about 5 foot above the surface (well illuminated by the headlights...about 10-15 ft in front of the van). The wings did not move or flap. It came from the area of the golf course and moved south across Teeter Rd. into a small patch of woods. It was obvious to me that the encounter shook the witnesses...to the point where their voices were shaking and strongly emphasizing what they has seen.